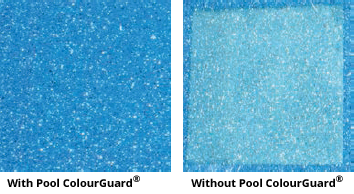 Pool ColourGuard® is the world’s first surface protection system for fibreglass pools that guarantees the colour will not fade. The extensive range of fibreglass surface finishes is protected from colour loss and weathering. Accidental and unintended readings of low pH and high chlorine levels will not harm the pool’s brilliant colour or textured finish. Acts like sunscreen on your pool. 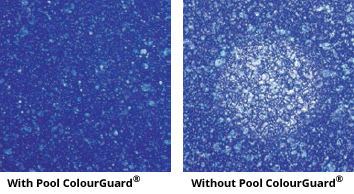 Special ultraviolet absorbers and inhibitors dramatically minimise any degradation of the surface by ultraviolet light. Never before seen on swimming pools and is maintained year after year.